This playground is named for the surrounding neighborhood, Seaside, along the Atlantic Ocean in Rockaway. The name Rockaway was probably derived from the Delaware or Chippewa words for “sandy place” (lekau akie). The region became known as Rockaway after it was colonized by Europeans during the 17th century. The Canarsie tribe sold the mostly barren land that now comprises Rockaway to English Captain John Palmer in 1685, under a deed granted by Governor Thomas Dongan (served 1682-1688). In 1687, Palmer sold the land to Richard Cornell, a prominent Long Island ironmaster; whose descendant Ezra founded Cornell University in 1865. The Cornell family owned this land until 1808, when a partition suit divided the plot into 46 parcels that were eventually sold to outsiders. The Rockaway Association, a group of wealthy New Yorkers, bought much of the property and, in 1833, began to build exclusive resorts. Within two years James Remsen had acquired title to a large portion of the penninsula. Remsen initiated a railroad project that connected the neighborhoods of Canarsie and East New York, delivering passengers to the steam ferries serving Rockaway. Hotels and restaurants catered to the beachgoers, and during the 1890s a variety of amusement parks were built. In 1898, the Village of Rockaway Park was incorporated into New York City. Improvements in transportation in the 1930s, under the direction of Arterial Coordinator Robert Moses (1888-1981), led to the growth of Rockaway. Two new bridges, the Marine Parkway Bridge (1937) and the Cross Bay Bridge (1939), connected the peninsula to Queens and Brooklyn. Improved railroad service and the development of the subway system further enhanced access to the peninsula, stimulating Rockaway’s growth from a seaside resort to a year-round residential community. Beach 109th Street and P.S. 225 bound Seaside Playground. The City acquired this property through condemnation in 1960 and transferred the property to Parks that same year. P.S. 225 Playground opened on February 4, 1966, jointly operated by Parks and P.S. 225. In June 1987, Commissioner Stern renamed the property Seaside Playground. 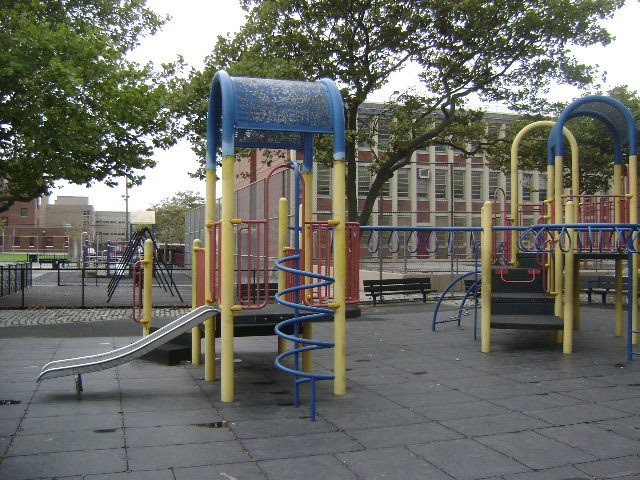 In November 1998, Seaside Playground received $83,000 in mayoral funds for renovation. Improvements included the installation of a spray shower and modular play equipment as well as the rehabilitation of the handball and basketball courts. Every summer, Parks staffs Seaside Playground with Playground Associates, who organize sports, games, arts and crafts, and special events for the local youth. The playground is also the site of the annual Rockaway Irish Festival, which celebrates Rockaway’s Irish heritage.